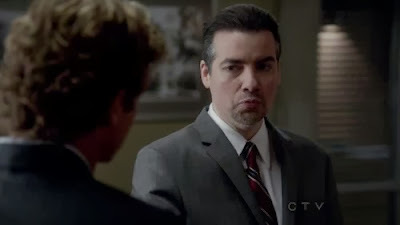 There are any number of ways you may know Kevin Corrigan: Community's drama professor, one of the thugs in 7 Psychopaths, a rogue trader in the second season of not-very-good TV show 'Damages'... the man gets a lot of work. Most relevant to this week's posts, he plays Bob Kirkland, homeland security agent, on The Mentalist. That's him justifying his inclusion on the Red John shortlist, even though he can't possibly belong on it. I'm not here to rehash my criticism of that decision by the producers, however - I'm here to talk about Kevin Corrigan's extremely interesting choice in portraying the character as... actually, I don't want to spoil it. Watch these two clips, and then I'll explain what Kevin Corrigan was thinking when he decided to play Bob Kirkland this way. Okay, all caught up? Great! "Dear Hollywood casting directors - Look, it's never fun to dwell on mortality, but let's face it: Christopher Walken isn't going to be around forever. And even after he's gone, people aren't going to stop writing Christopher Walken-style parts, so when that day finally comes, I think that you should be considering me, Kevin Corrigan, for those parts. Thank you for your kind consideration." Can I possibly be wrong? what i want to know is why in the world he'd choose to ape a living actor and what did walken think of it? seems a dozen years back, corrigan was in an obscure flick with walken... so, could his walken act date back to that? Neat! I didn't know Kevin Corrigan was in Scotland, PA (which I still have to see). My observation was based on a scene they shared in 7 Psychopaths. The plan to be a younger version of an aging star doesn't always work out. Consider: "Dear Hollywood casting directors - Look, it's never fun to dwell on mortality, but let's face it: Jack Nicholson... blah blah blah... Sincerely, Christian Slater." Also, Walken's from Queens and Corrigan's from the Bronx.